Thanks to Sage and Adam, I now have 70 35 copies of the original print version of Dark Heart of the Dreamer to put into your hands. Thanks to the magic of USPS Global Forever stamps, shipping to anywhere in the world is included in the $10 price. The Paypal button below will get you one, assuming that they aren’t already sold out. To summarize, Dark Heart of the Dreamer is the first supplement for Dungeon World in the Planarch Codex series. More information about its contents is available here on the page for the PDF version. The print version is a 3.5×5-inch pocket-sized, 32-page, chipboard and 100% recycled paper, soy-based-ink offset-printed, saddle-stitched (i.e. stapled) booklet. It is very stylish, but because of that, it is more expensive than something you might print on a photocopier. There’s a possibility that these may be reprinted as part of a Kickstarter for future Planarch Codex material, but no promises on when that will be. NOTE: It’s possible that there may be some issues with shipping. This is always the case when you are dealing with physical objects and, potentially, multiple different international postal systems. Please be patient. Also, I reserve the right to refund anyone’s money after two good-faith attempts to ship the booklets, since I don’t want to keep sending the limited number of copies I have into a black hole. Jason Morningstar asked if I was willing to share the InDesign document for Dark Heart of the Dreamer so other folks could see how I put it together. But of course! Here’s a modified version of the layout that uses easily available fonts: Times New Roman, Bebas, and Blackmoor LET. 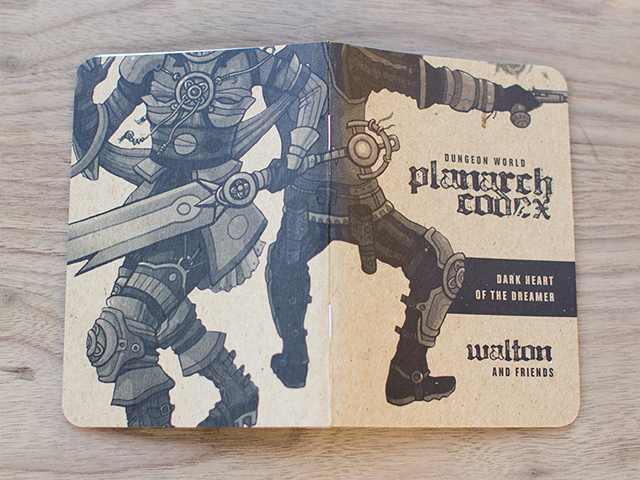 DARK DESIGNS: A Scoutbook mock-up inspired by the Planarch Codex. Sage and Adam’s already immensely successful Kickstarter campaign for Dungeon World just announced the first stretch goal, my Planescape / Eberron / Everway / Exalted / Earthdawn / Shadowrun-inspired planar adventure/supplement, Dark Heart of the Dreamer, which is zooming in from the outer voids to melt faces. “Dark Heart of the Dreamer” is a sandbox-style adventure and setting toolkit torn from the pages of the Planarch Codex, the lost gazetteer of the planes. The monstrous city of Dis is gradually consuming the entire cosmos and now hosts refugees from dozens of destroyed worlds. Can a motley posse of destitute freelancers brave the Ocean of Fire and seize the enormous living treasure their slumbers have revealed? And what will their efforts mean for Dis, its inhabitants, and the city’s newest victims? “Dark Heart” points a finger in the direction of epic dangers and then hands you the reins. Writing and layout by Jonathan Walton with a cover image by the great Jenn Rodgers. Special thanks to Hans Chung-Otterson and Simon Carryer. The new heritage rules in the Planarch Codex (“when you invoke your rights of blood and tradition”) means that humans need some monster moves. Here’s my initial shot at those. Humans are short-lived creatures of passion and destiny. They may be weak and petty from the perspectives of most other species, but they feel more deeply, love more strongly, and recklessly attempt the most dangerous and impossible things, for their timelines are measured in years, not centuries. And, for that, the gods and demons favor them above nearly all others. Want to get things done or shake things up? Throw some humans at a situation. Cleric! You have fallen in with a band of planejumping sell-swords, cut-purses, and diabolists! Yes, for I have been defrocked for the crime of ________ and sent into exile, though the god ________ still heeds my prayers and must have some plan for me. Yes, for I am the last surviving keeper of the ancient and noble faith of ________, now lost to (violence, time, cataclysm, fissure, or conversion). Yes, for I am a dark templar of my faith, charged to seek out lost secrets, sources of power, and ________, all for the greater glory of ________. Fighter! You have fallen in with a band of planejumping apostates, cut-purses, and diabolists! Yes, for I was born and raised among the wretched and outcast in ________, living hand to mouth, dreaming of future riches and ________. Yes, for I am the black sheep (or exiled scion) of the noble house of ________, and this is the ignoble company I keep, obscuring and protecting me from ________, who has “great plans” for me. Yes, for I am through with the wars and battles of ________, and will live out the rest of my days as a servant to my own interests, seeking ________. Rogue! You have fallen in with a band of planejumping sell-swords, apostates, and diabolists! Yes, and what else is new? I used to ________ with ________, and they were no better than this lot, that’s for certain. Yes, but it’s only a temporary situation. You see, I have grand plans for ________, if only ________ would stop blocking my path to true greatness. Yes, but how else would these idiots know where to find big piles of loot? They’re the unfortunate cost of doing business and I have this great job in mind where we can get ________ from ________. Wizard! You have fallen in with a band of planejumping sell-swords, apostates, and cut-purses! Yes, and such is the lot of a wizard, to be shunned and feared by pleasant society. Luckily these unsavory types don’t ask too many questions about my strange and unsavory practices, such as ________ and ________. Yes, but once the wizards of ________ acknowledge the true earth-shattering potential of my new line of research into ________, they will beg me to teach them my methods. Yes, but I’m not your average hide-behind-the-armored-dude hedge-mage who crawls head-first into a hole in the ground wearing fancy robes. I like to get my hands dirty. How else do you learn the real stuff like ________ and ________?